Cyclops, of psychiatrist Charles Xavier’s X-Men. With its most recent Secret Wars event, Marvel destroyed most of its parallel universes where some of the most interesting stories were set. These “elseworlds” stories (those that take place outside of a publisher’s regular canon) reimagined classic characters like the X-Men and the Avengers as versions of themselves that were nothing like anything we’d ever seen before. Though it’s not difficult to understand why Marvel wanted to simplify its multiverse as it headed into its latest publishing reorganization, in doing so, it closed the door on a number of engrossing stories that explored what a true science fiction multiverse could be. The weird thing about the multiverses we see in comic books is that the vast majority of parallel universes are more or less identical to the “prime” continuities we’re more used to seeing, save for a couple of specific changes. We’ve seen apocalyptic universes where the Punisher killed everyone and desolate universes ravaged by intergalactic zombie viruses, but there’s a way in which those kinds of stories feel very much like pieces of Marvel-approved fan fiction that aren’t actually as imaginative or different as they initially seem. Marvel’s Ultimate universe was the home to some of the publisher’s most iconic stories that have gone on to shape the Marvel Cinematic Universe, but it’s difficult to argue that those comics were much more than slightly more mature, narratively darker spins on stories from the 616, or main, universe. That’s what made limited series like Marvel’s Noir and 1602 such surprisingly fun reads. Though they told stories about the same cast of characters, they delighted in placing them in ridiculously foreign settings that brought out new and fascinating aspects of their personalities. The X-Men investigating the murder of Jean Grey. As its title suggests, the Noir series reimagined all of your favorite Marvel heroes and villains and baseline humans living in the early 20th century. Because most everyone in the Noir universe had no real superpowers to speak of, the writers and artists working on those series had to tap into each character’s core essence in order to create a version of them that still felt inspired by the original. 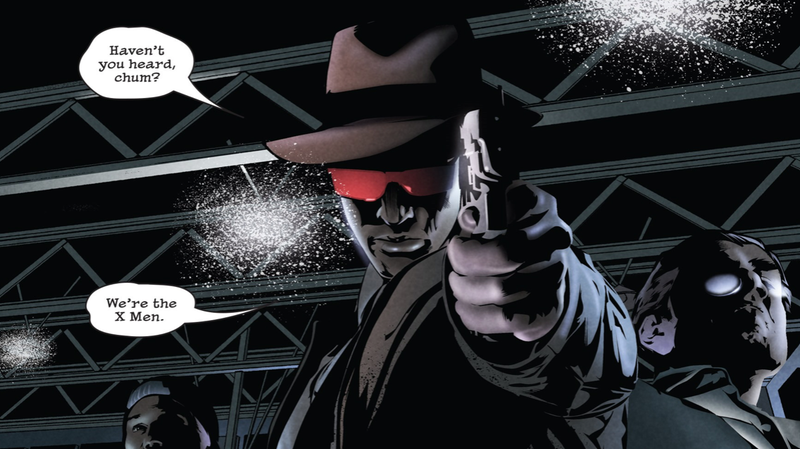 X-Men Noir’s spin on Charles Xavier is a brilliant psychiatrist who firmly believes that sociopaths are the next step in human evolution, and he takes it upon himself to gather a group of disturbed teenagers and take them under his wing to test his hypothesis. All of Xavier’s X-Men are murderers, but their personality disorders manifest themselves in a variety of unique ways that are unsubtle nods to their traditional counterparts’ mutant abilities. Cyclops is a deadly shot who wears a pair of signature ruby-tinted glasses, Jean’s a con woman with an uncanny knack for getting into people’s heads, and Magneto is a police chief who believes in eugenics. Because this Xavier isn’t a professor, X-Men: Noir perfectly captures just how problematic his relationships with young people have always been. More importantly, though, the series challenges us as readers to reconsider the way we’ve always thought of Marvel’s mutants as heroics outcasts first, and dangerous anomalies second. In the same way that Noir delved into the dark and gritty shadows of Marvel’s players, series like those from the 1602 universe told stories with a heightened sense of magic and wonder that were set in the Elizabethan era. When Neil Gaiman began writing the first 1602 miniseries, 9/11 had recently occurred, and the writer set out specifically to tell a superhero story divorced from the trappings of modernity that could really highlight the fantastic over realism. In the 1602 universe, Thor’s sister Angela and her lover Sera are reimagined as renowned hunters of the witchbreed. As inexplicable weather phenomena begin to pop up all across Europe, the Queen taps a number of her court members—like magician Stephen Strange, and her head of intelligence Sir Nicholas Fury—to retrieve a fabled weapon hidden away by the Knights Templar. 1602 is populated by humans who live in fear of the “witchbreed,” a catchall term for anyone with metahuman abilities. Throughout the initial series and its subsequent spinoffs, superheroes effectively became stand-ins for all manner of persecuted minorities and marginalized people hurt by religious intolerance. Unlike Noir, in which most of Marvel’s characters from different properties were kept largely separate from one another, 1602 found a way to recreate a more complete version of the 616 in a strange world that was equal parts familiar and new. Marvel’s really leaning into the idea that what readers want right now is a return to the way things used to be, where Captain America’s a hero and Thor is a man for some reason, and so it’s highly unlikely that its sprawling universe is returning any time soon (though there’s hope). That being said, Elsewords-esque comics like the Noir and 1602 series really brought something special to Marvel’s portfolio that make them worth revisiting now more than ever. What are your favorite out-of-continuity tales?